Learn How To Make Money And Get Exposure For Your Music By Licensing Your Songs In TV, Films, Video Games And Advertising In A Free Ecourse From Berklee Alumnus Aaron Davison All About The Music Licensing Business! How to immediately get started in the TV and Film music business and start making money via music licensing. Where to send your songs today for potential placement. What kind of music has the best chance of being licensed and used. How to turn your music into a full time income machine that generates passive income via music licensing. Why many musicians overlook this lucrative field. How To Copyright Your Songs. How To Earn A Full Time Income Through Music Licensing. The Different Types Of Deals You'll Encounter In The Music Licensing Industry. How To Self Publish Your Music Vs. Working With A Publisher. Subscribe today and get a totally free ebook about music licensing and how you can get your songs in TV and Films! And For A Limited Time Receive A Free Video Tutorial Called "An Overview Of The Music Licensing Industry" when you sign up today! Sign up today and receive a free ebook, "A Songwriter´s Guide To Music Licensing"! 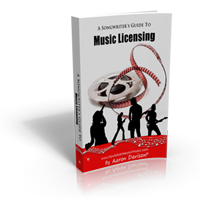 This free ebook (normally $19.95) covers the basics of the music licensing business and covers how you get paid, music publishing, music supervision, how to get started and much more.